Welcome to October 4, Day 4 of 31 Days of Halloween right here on Sewhooked! Today, we’re dialing the craft clock WAY back! As you all know by now, I spend a good deal of my time designing quilt patterns, sewing and making quilts. In another life, when I had small kids to attend to, I designed and shared many crochet projects. You can find many of those for free right here. 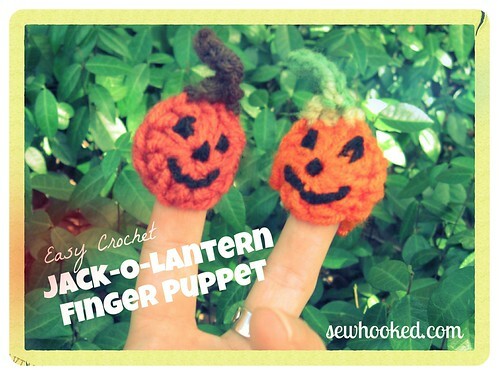 One of my fast favorites is this Jack-0-Lantern finger puppet/pencil topper, originally created for my daughter’s kindergarten class. I’ve made many of them since then, usually for gifts or swaps. Sometimes, just for fun! You can make a whole pile of these assembly-line style in an afternoon in no time flat! In addition to pencil toppers, you can pop one on a lollipop, add a French hook for earrings or crochet a chain to create a necklace for a small person in your life…or for yourself! Ch 4, dc in 4th ch from hook 11 times. Join with sl st in top of ch 3. Leave a tail about 8″ long for stitching later. 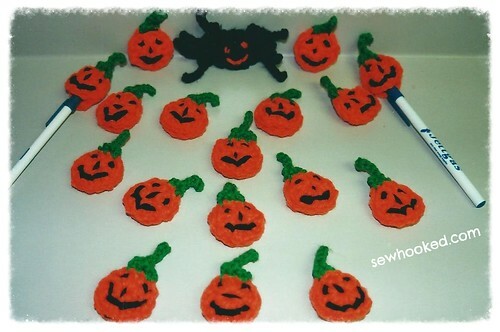 Using black yarn with yarn needle, make Jack-O-Lantern face on one circle. Finish off. Using tail, and a yarn needle, join two circles by whip-stitching through both sc. Leave an opening at the bottom large enough to put your finger or a pencil inside the pumpkin. Finish off. With pumpkin facing you, sl st in sc one st to the right of center. using face as a reference. Sc in next st, sl st in next. Turn. (Do not ch 1) Sl st in next two st. Ch 5, sl st in 2nd ch from hook. Sl st in next 3 ch, sl st again in base sc. Finish off. If making a fridgie magnet, only make one circle before adding the stem and then glue a magnet to the back. For earrings, add a French hook with a jump ring through the stem. For an easy child-friendly necklace, instead of a stem, with green or brown, sl st in sc one st to the right of center of your circle (use face as a reference), sc in next st, ch until you have a chain the proper length for the necklace you want, sl st in st, Finish off. 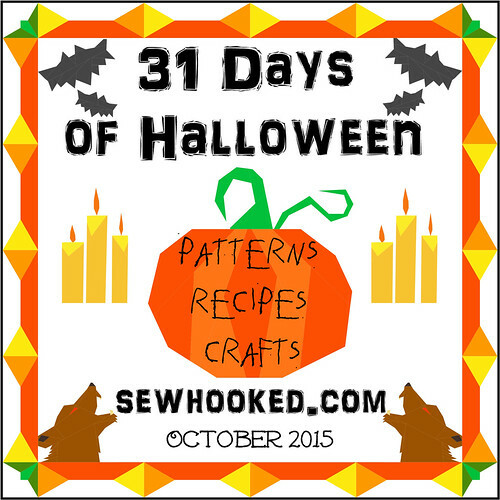 Are you making projects from 31 Days of Halloween? Share your photos with my flickr group! There will be a fun surprise after Halloween for one lucky winner! See you tomorrow for more Halloween goodness! 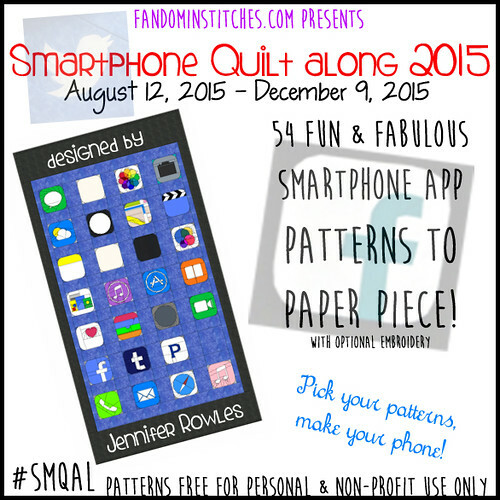 Visit Fandom in Stitches for the Smartphone Quilt Along happening now! 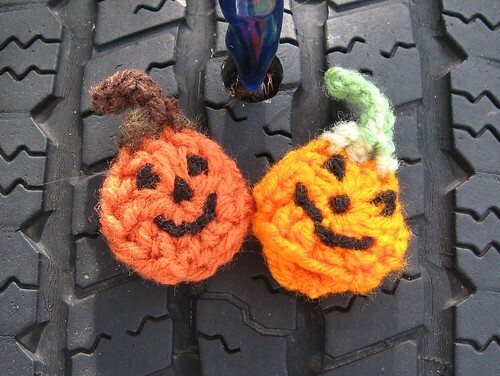 This entry was posted in crochet, halloween and tagged 31 Days of Halloween, halloween, halloween past on October 4, 2015 by Jennifer Ofenstein.